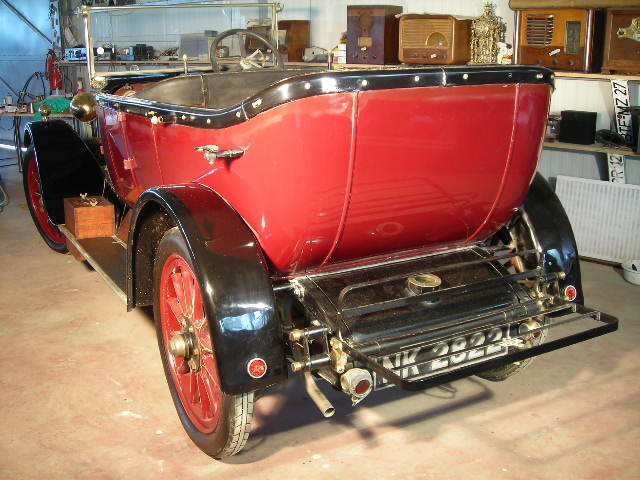 A very well made car of the 20s. Full of great features, which I shall analyse below the third photo . 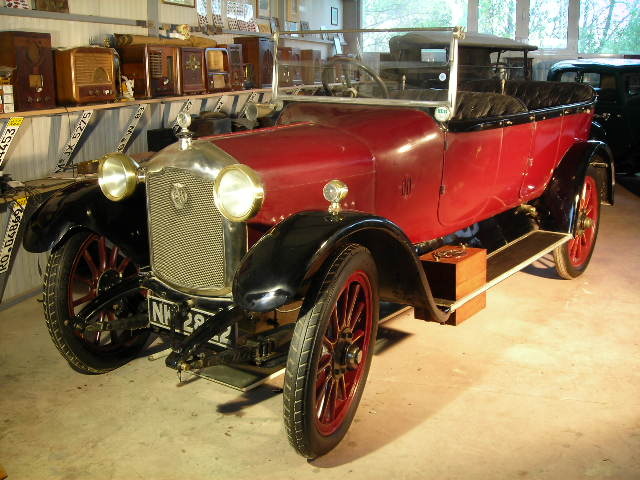 It had a four cylinder, water cooled, side valve engine of 2297 cc with an SU carburettor made by Rover under licence. Around 5000 were made before World War I. 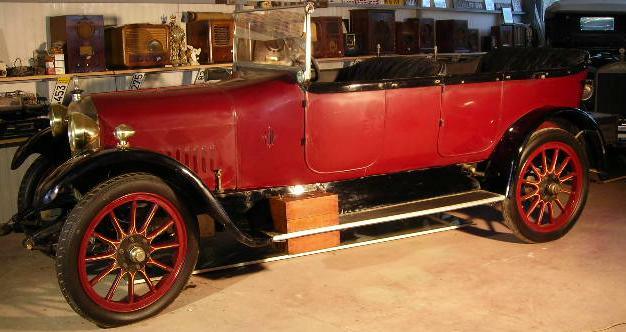 The transmission was three speed, separate from the engine, and drove the rear axle which had a worm drive. Semi elliptic leaf springs were fitted front and rear. Rear wheel brakes, operated by the hand lever were fitted, with a transmission brake operated by the foot pedal. It is made of aluminium, iron and wood. The electrical system is totally independent from the body, and all electrical devices are equipped with two poles, including starter motor and dynamo! You will not find another car on the planet, like this. 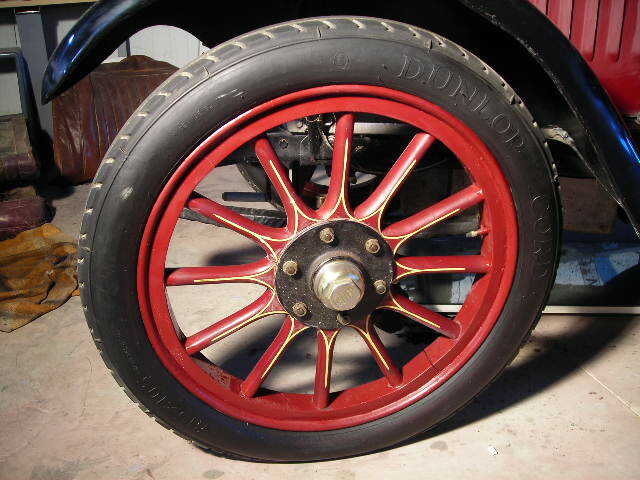 It is the only car in the world that has wheels with metric tyres. 815X105 millimeters!!! Besides, I noticed that the screws are metric! The English went mad with this one, or was it an experiment perhaps? These wheels are the longest in diameter, I have ever seen. 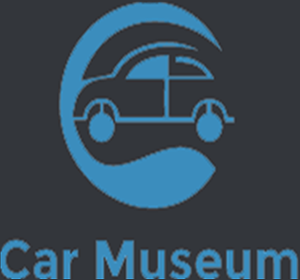 It is the only car with three doors. The driver has to get in from the passengers door !!! The battery is situated outside the car, inside a beautifully made wooden box. On the dashboard it has a speedometer that includes a trip-meter, an ammeter, a clock and a rotatable light. The engine starts without a key. 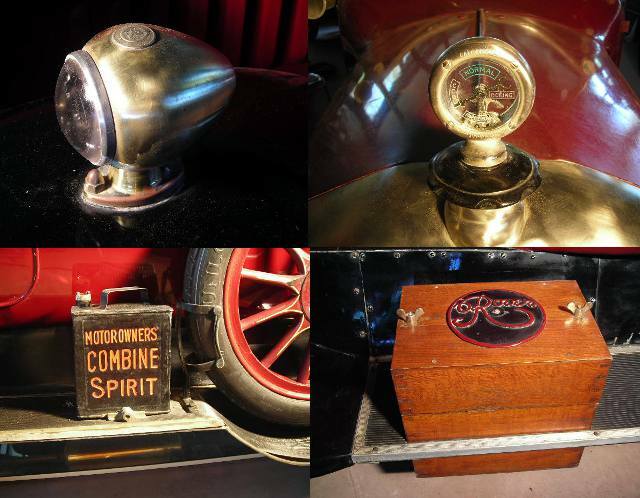 There is, also, a brass fire extinguisher near the passengers door and a large can of fuel next to the spare wheel, marked “Combine Spirit” ! It is equipped with a liftable and adjustable orange screen that separates the passengers from the driver. The two rear doors have a comprehensive collection of tools. So many tools that you can even do carpentry! If you don’t believe it, look at the photo below. In the engine compartment it has a pretty oiller, on a special base! The city lights at the front have a thick glass lens in front of the light bulb. All moving parts are equipped with a little brass greaser. The cooling fan is made of die cast aluminiun! The SU carburettor is made with brass! 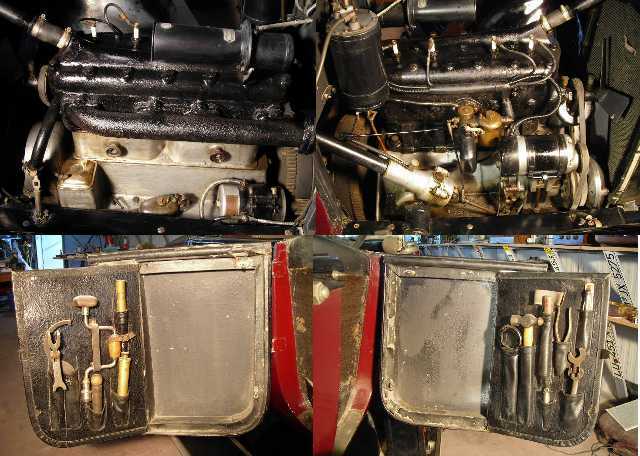 The brass carburettor can be spotted easily, as well as the autovac (the secondary petrol tank), that works with the vacuum from the inlet manifold. The horizontal cylinder, you see on top of the engine is a horn. The vertical cylinder is the ‘Autovac’. The fan can, also be seen. It is cast ! You can see the tool-cases which are hidden in the rear door cavities. The cases are open in the photo , as well as the doors. The one on the left is the LHS door and the one on the right is the RHS door. *The House of Eliott is a British television series produced and broadcast by the BBC in three series between 1991 and 1994. The series starred Stella Gonet and Louise Lombard as two sisters in 1920s London who establish a dressmaking business and eventually their own haute couture fashion house. It was created by Jean Marsh and Eileen Atkins, who had previously devised Upstairs, Downstairs. It was written by screenwriter Ginnie Hole. Previous story Τι είναι το AUTOVAC ?